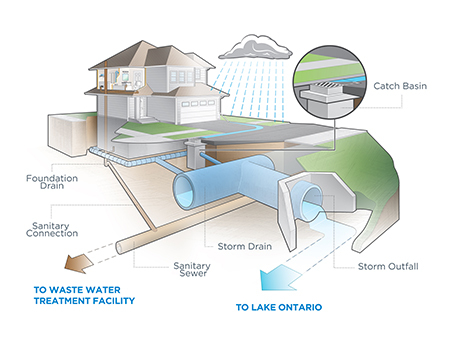 Stormwater is the rain and melted snow flowing from our properties into our streets and down into more than 40,000 storm drains; this water flows through a large and complex network of pipes and waterways directly into Lake Ontario. What is the City Stormwater Drainage System? Our stormwater drainage system protects water quality and lowers the risk of flooding that can damage your property and the environment. For thousands of years, the city's creeks and rivers have carried water from high ground to Lake Ontario; they really are the natural backbone of the city's stormwater drainage system. The City monitors and maintains these watercourses. For example, many creeks and rivers are supported with large stones to prevent erosion (river banks washing away). These natural watercourses alone cannot quickly and safely move the ever increasing amount of stormwater in a growing city like Mississauga. Every sidewalk and street is designed to direct stormwater into inlets, catchbasins and storm drains. Most of the city's drainage system is made up of underground pipes, engineered ponds, catch basins and inlets. To keep our system in good working order, the City invests in planning, design, construction, operation, maintenance, renewal and by-law enforcement activities. To learn more about how the City maintains and adds to our $2 billion system, visit the Programs and Services and Understanding How Water Drains in the City pages.